We’re nearly a fifth of the way through the season (already! ), and while the Canadiens have the best record, and the Rangers the best goal differential, there is no team hotter than the Chicago Blackhawks. It’s a bit of a surprise, given their roster turnover and the number of unproven young players, but you cannot argue with results. The big question is: Is it even close to sustainable? 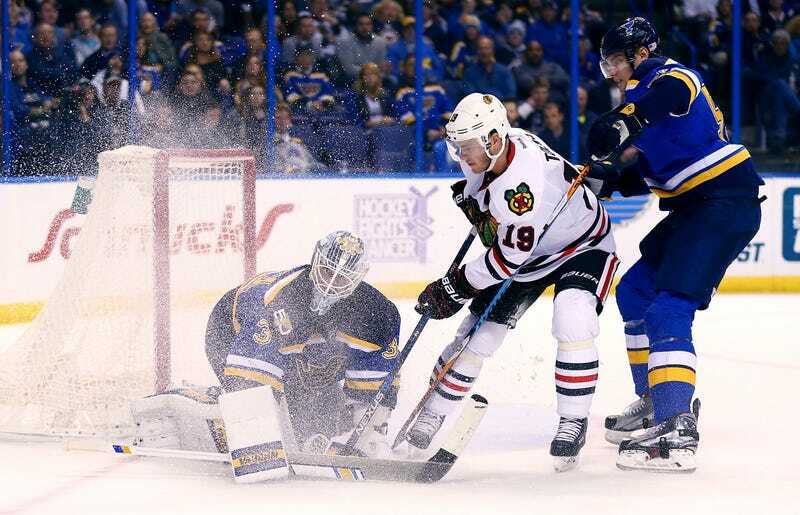 After their 2-1 overtime win in St. Louis last night, Chicago has now won seven straight and are 8-0-1 in their last nine, and are outscoring opponents 30-15 over that stretch. They’re atop the Western Conference, and everything is going right. The winning goalscorer was Artemi Panarin, who, when he put this wrister through traffic past Jake Allen 25 seconds into OT, was easily the most rested player on the ice; he had spent the end of regulation in the penalty box, serving a fighting major for dropping the gloves with Scottie Upshall. Panarin racked up a Gordie Howe hat trick—a goal, an assist, and a fight—but the real star of the game, and of the Blackhawks’ hot streak, is goalie Corey Crawford. Crawford is a month away from 32 years old, and you feel like you know what you’re going to get from him in any given season (even if his last two years have statistically been the best of his career), but he is On One right now. He’s averaged a goal a game in his personal six-game winning streak, and has only allowed four goals in his last five starts. And they haven’t necessarily been those quiet, workmanlike starts he has a knack for stringing together—he has had spectacular moments in each. How good is Crawford right now? Blues coach Ken Hitchcock says he’s in opponents’ heads. Crawford’s goaltending—a .965 save percentage in his last seven starts—is the biggest reason the Blackhawks haven’t lost in regulation in three weeks. That’s not a number any mortal can keep up, and they’ve been just as unreal on the offensive end, regularly outscoring opponents while being outshot, sometimes significantly. There’s a stat called PDO, and it’s calculated merely by adding a team’s shooting percentage to its save percentage. The thinking goes, that since both of those numbers are, in the long run, largely a matter of luck, any team’s PDO is likely to regress toward 100. Any PDO higher than 100, then, would indicate a team that’s been luckier than its underlying possession stats would suggest; it’s scoring more and/or allowing fewer goals than it ought to. The Blackhawks’ 5-on-5 PDO this season is a whopping 106.2, significantly better than any other team. The Blackhawks have real holes: They are rostering six rookies, and viable third and fourth lines haven’t emerged yet. They’ve compensated for it with strong work by their stars, and more than a little good luck. If they can get things in gear, and get contributions from at least a few of their depth players, they will remain real contenders even if their luck evaporates.